Here is a golden opportunity for UAE residents. 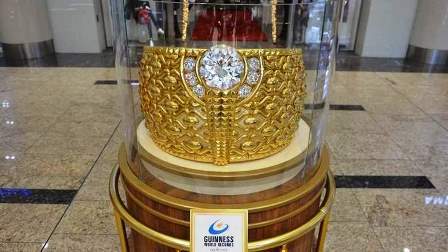 The world's largest gold ring has made its way to the Sahara Centre and will be on display there for a whole month. The 21-carat Najmat Taiba (Star of Taiba) weighs almost 64kg and is studded with 5.1kg of precious stones and diamonds. It also sports 615 Swarovski crystals. The Najmat Taiba cost its owner only $547,000 to make back in 2000, when gold was priced at about $250 an ounce. Gold prices have since soared and are now trading at about $1,497.5, giving the ring an immense value estimated at $3 million. About 55 jewel smiths worked for 10 hours a day for 45 days to craft the ring, which is owned by Dubai-based company Taiba.